It is almost incomprehensible—the rapid growth of Faustine Steinmetz—for it flashed before our eyes like an electrifying bolt of lightning. Several years ago she presented her debut at London Fashion Week at the Insitute of Contemporary Art. This was an introduction to her technical mastery, her deconstructionist prowess. As seasons went by she challenged the ‘denim designer’ moniker she quickly attained; Swarovski crystals were added as an illusory device, yarns spun in Senegal injected a savoir-faire touch to proceedings. For Spring 2018, her first catwalk show, her couture-like sensibilities were catapulted to new heights: she grappled with mundanity, reworking our everyday ‘uniforms’ and using artisanal techniques and sustainable fabrics to forge a new identity for them. ’Facsimile’, it was called. The archetypal wardrobe, according to Ms. Steinmetz, consists of a pair of jeans (a prerequisite at this label), a trench, a tracksuit and a shoulder bag. It would be easy to present them as they are, make a statement with styling. However, this wasn’t the designer’s intention. She entirely reshaped the garments by making them from scratch, exploring forgotten about artisanal techniques, ensuring the fabrication is completely sustainable. Tracksuits are emblazoned with the brand’s logo and made from frayed denim; t-shirts are artfully slashed. Perhaps the most inventive technique, the thick brushstrokes applied to trousers reappeared, creating a washed denim effect. The psychology behind clothing played an important part in the collection. Last season she explored the democracy of denim, its indiscriminate personality. (To reiterate the point she made last season, she wants her clothing to be perceived as unisex; once again, there were male models alongside the women.) Secondly, she strives to create an ethical business, so not to subscribe to the fashion industry’s bad reputation. Furthermore, one could look at this and ponder the repetition of archetypes’ reflection the blanched society we live in. Everyone dresses the same. The beige trench, the white tracksuit, the blue denim. They are wardrobe tropes common to us all. Here, with an artisanal touch, they are given a new lease of life and with Ms. Steinmetz’s deconstructionist flair, they appear brand new. 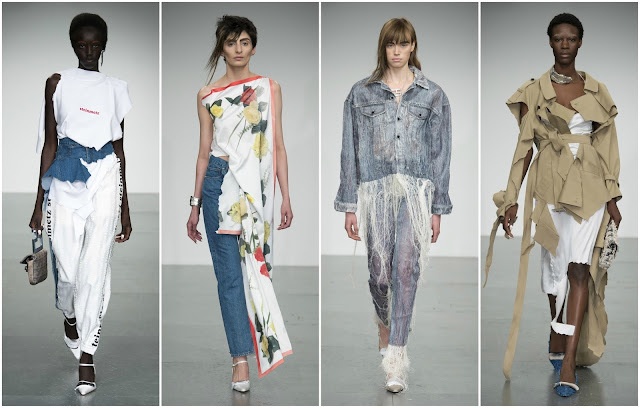 It’s only been a few years and Faustine Steinmetz carries itself with a level of sophistication and maturity that many other emerging brands have failed to secure. Constant innovation, fruitful experimentation collide with deconstructionism. It all melds together quite nicely, fusing the techniques made famous in the 1980s by the Antwerp Six with a modern day, artisanal touch.